Four MAN 18V48/60TS engines generate electricity at the Belawan power plant. 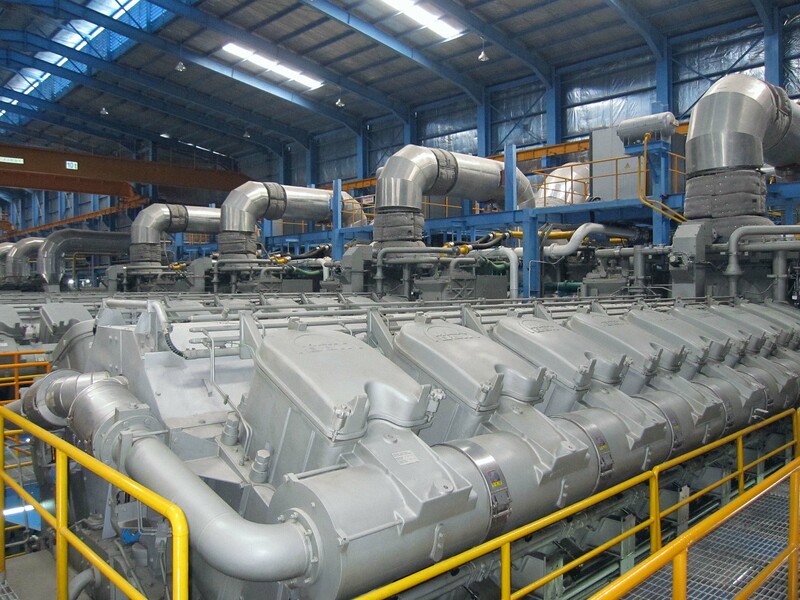 MAN Diesel & Turbo has signed a service agreement with PT Berkat Bima Sentana (BBS) for the maintenance of four 18V48/60TS engines in a newly built power plant in Belawan in the north of Sumatra. The agreement covers, among other services, the supply of spare parts for scheduled maintenance intervals and PrimeServ Online Service, an automatic and continuous monitoring of all four engines. The contract will run for five years and assures the customer a key account relationship with MAN PrimeServ, the service division of MAN Diesel & Turbo. "The service solutions in our portfolio are flexible and tailored to fit individual needs. The concept of such custom-made service agreements supports a closer relationship with our customers", explains Dr. Michael Filous, Senior Manager at MAN Diesel & Turbo and Head of PrimeServ O&M. "The successful conclusion of the service agreement is proof of the trust that the customer places in MAN", says Stefan Eefting, Vice President at MAN Diesel & Turbo and Head of MAN PrimeServ Augsburg. “The cooperation with MAN has been trustful and highly professional. We thank them for the excellent services provided so far and are looking forward to the future cooperation”, agrees Tarius Makmur, Director of Operations at BBS. “Due to the long-term nature of such agreements, plant operators profit from full maintenance planning and logistics support, strategic stocks, price predictability for scheduled maintenance and reduced engine downtime” summarizes Wayne Jones, Senior Vice President at MAN Diesel & Turbo and Head of MAN PrimeServ Diesel. MAN Diesel & Turbo supplied the plant in Belawan with four MAN 18V48/60TS engines and successfully commissioned the facility at the end of 2014. The plant has a total capacity of close to 160MW, approximately 80MW of which are supplied by the new 48/60TS engines. The remaining power is generated by eight overhauled MAN 9L58/64 engines. “Indonesia is on a strong growth path and in need of a stable energy infrastructure to support it. The new plant makes a significant contribution towards achieving this goal,” adds Dr. Hermann Kröger, Senior Vice President at MAN Diesel & Turbo and Head of the Power Plant Business. The MAN 18V48/60TS engine runs with two-stage turbocharging, where a low-pressure and a high-pressure turbocharger are arranged in series. Twostage turbocharging delivers almost twice as much engine charge air as conventional turbochargers, allowing more operational flexibility. Depending on its operating mode, fuel consumption can be reduced by up to 3.5 percent while maintaining the same level of performance. This makes the 18V48/60TS one of the most efficient and cleanest engines in its class. It meets the World Bank’s 2008 emissions specifications when operated with all conventional fuels.